Isabel Gallegos, owner and CEO of Gallegos Wines is tired of always being responsible. Tending to everyone else's needs before her own has left her divorced, unhappy, and unfulfilled. The winery had been her parents dream, but never hers, though she devoted herself to making it a success. 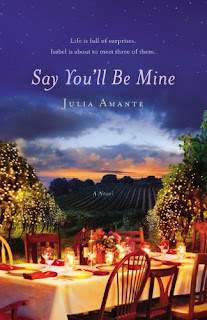 After much thought, Isabel decides to sell the winery, move to the beach, and finally take back her life. But just as these changes are about to take place, Isabel's cousin and her husband are killed and she becomes the legal guardian to their three young children. Convinced this must be a mistake, Isabel returns to Argentina, intent on finding a more suitable home—and parent—for the kids. But as she spends time getting reacquainted with her family and her past, the decision to return to her own life grows complicated. Should she bring the children home with her, or find a way for them to stay in Argentina? Should she stay with them? Can she really give up her own dream, just as she's about to realize it? I was really psyched about Say You'll Be Mine. 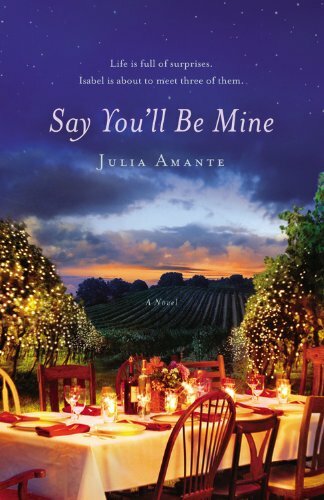 A woman at a turning point in her harried and frustrated life has an opportunity to begin again, with a new life in Argentina by leaving the vineyards in California behind and becoming a surrogate parent to her late cousin's children. Sounds like a great plot and a fabulous opportunity to show growth and the discovery of love in Isabel's life, heart and soul. I struggled to stay with Say You'll be Mine. I did read it and finish it, but it took several tries, as it just didn't hold my attention. I just didn't care. I thought Isabel should have grown up, developed a heart and moved in a more positive direction, especially with the children and. In some strange way, Isabel reminded me in a way of a modern female Scrooge. Cold, driven, selfish and heartless. The way the character "cared for" and treated the kids just made me want to throw my e-reader across the room. OH... I wish I had been sent a printed galley as I would have tossed it. I thought the premise was SO full of great story possibilities...and yet we got too much repetitive information. Reading over and over about the issues Isabel's ex has with her when she doesn't have the kids just got old for me. This could have been great! I mean, come on, the cover art was FAB-U-LOUS! The story? Not so much. I am giving this 3 out of 5 stars, some parts are OK and I am sure others loved it. Maybe I just expected too much. I was provided this e-galley from the publishers through NetGalley, and that in no way affected my review.